Nintendo didn't just dominate the American video game industry in the late '80s. It was the video game industry. As the 1990s began, Nintendo held a stranglehold on 80 percent of the market, a statistic made all the more impressive when you realize that the other 20 percent was split among three different competitors. The most promising of these was a scrappy little upstart called Sega. The new book Console Wars tells the story of Sega's surprising transformation from underdog to—for a little while anyway—number one. Under its new leadership, the company introduced Super Mario's first real threat in the form of a speedy blue hedgehog; a cutting edge distribution plan that transformed video game releases from haphazard shipments into the orchestrated global events that they are today; and a cutthroat marketing onslaught that stole away many of Nintendo's older players by offering a with-it, alt-rock music video veneer that made its competition feel like kid stuff. 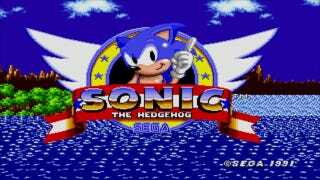 While Sega's 16-bit Mega Drive was making a modest name for itself in Japan, things were different in America, where the re-branded Sega Genesis was exciting the media but hardly making a dent in Nintendo's 8-bit empire. Sega, ostensibly not having much to lose, recruits Kalinske—whose past accomplishments included rescuing Mattel's Barbie doll line from near-extinction, helping to father He-Man, and leading the team that got America's kids to take their vitamins by shaping them like Flintstones characters—to take over and see if he could turn things around. Kalinske and his crew laid down plans for what must have seemed like a desperate Hail Mary scheme to become relevant: investing millions in an aggressive smear campaign against Nintendo; touring the malls of America to show its games side-by-side with its competitor's to prove which of the two America preferred (in a nod to the famous Pepsi Challenge blind taste test); and, in what was most shocking of all to Sega of Japan, slashing the price of the Genesis while also packing in its most promising new game, Sonic the Hedgehog, for free. The move forced the company to take a gigantic loss on each unit sold to get Genesis in as many homes as possible, on the gamble that additional software sales would more than make up for the money consumers would have spent otherwise. The gamble paid off, and as the book progresses, we see Sega of America quickly grow from a 50-person family into a corporation with a headcount of over 400, with all of the celebratory moments—and the growing pains—that come with it. By the end of the book, Nintendo's Goliath has been humbled and forced to evolve, a new competitor in Sony's PlayStation is just on the horizon, and Sega's rise to dominance fades as quickly as it began: a victim of censorship concerns, in-fighting and, perhaps, growing a little too big a little too fast. It's a great story, and I can see why Hollywood's interested. Where the book gets a little off-putting at times, however, is in the writing itself, specifically the dialogue. Harris writes the story from the perspectives of each of its key players, in a style more like a novel than a work of journalism. There's nothing wrong with that approach (I can't imagine David Sheff's Game Over, the pinnacle of Nintendo history books, written any other way), but in Harris's hands, Kalinske, his colleagues, and even his competitors become inhuman, giving exposition that comes across as insincere and stilted. "You're obviously an intelligent man. That being the case, I think you can imagine where I might attempt to point out a few imbalances in that logic. Nevertheless, I acknowledge that we're on different sides of the table here and, naturally, ought to possess divergent perspectives on issues like these." Nilsen looked out the window, his eyes taking in the towering buildings. "We've done all we can. Our fate is now in the hands of Trafficles," Nilsen said. When the others didn't seem to get it, he elaborated: "You know, the Greek god of gridlocks." "Fine, fine," Fischer replied playfully. "Let's have an honest discussion. Rid yourself of the weight of that golden crown and I'll set aside this pesky jester's hat. What is it, specifically, that you'd like to know?" I point out this dialogue not to be critical of Harris' writing abilities, but to make a point about the delicate nature of writing a work of embellished journalism: The less believable the writing is, the more readers must rely on their suspension of disbelief. As I got further into the book, I couldn't help but question whether it was conceivable that anyone had ever spoken these strange sentences, which made the book feel more like fiction than a work of journalism. And the more I wondered about that, the more I couldn't help asking myself the next logical question: If I don't trust the dialogue, what else don't I trust? As Console Wars wraps up, readers are led to one overwhelming conclusion: Under the unfettered leadership of Tom Kalinske, Sega of America thrived, was practically invincible, and would have continued to dominate the American video game market, if not for the meddling of a suddenly overzealous Sega of Japan. Harris tells us that every bad decision Sega made that resulted in a loss of market share—the ill-advised 32X add-on and the premature launch of the doomed Saturn console among them—was entirely within the purview of Sega's stubborn parent company, and was made despite Kalinske's protests. The narrative even goes so far as to suggest that the mere existence of Saturn's competition—the Nintendo 64 and Sony's original PlayStation—was Sega of Japan's fault. Kalinske, Harris tells us, orchestrated partnerships that would have essentially put the technology behind these into Sega products instead, but his Japanese bosses dismissed the plans with little to no explanation, forever dooming Sega into a distant third and, we're left on our own to conclude, ultimately out of the hardware business entirely. And while all of that may be completely accurate, I can't shake the feeling that despite the book having more than 200 interview subjects, I'm missing another side of the story. Regardless, the amount of research and dedication Harris put in is practically unparalleled in video game journalism, and the previously-undisclosed information contained in its pages is enough to make even the most seasoned video game history buff excited. Despite its flaws, Console Wars has earned its place in my video game history library, right next to my dog-eared first print of Game Over. Frank Cifaldi is a video game historian, archivist and developer living in Oakland, CA with his cat, Tony, and a several thousand old video game magazines. His mother follows him on Twitter @frankcifaldi, and he really wants you to play #IDARB when it comes out later this year.